The UK government has attempted to sabotage the European Union’s climate goals – even though they won’t be affected after Brexit. So why would they target EU energy policy? Zachary Davies Boren of Energydesk investigates. 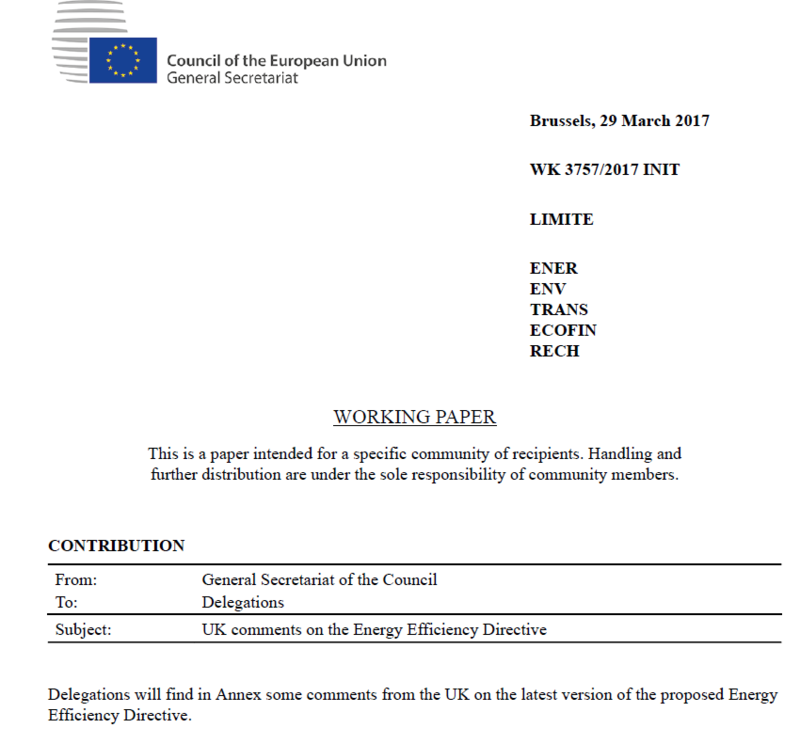 Documents obtained by Energydesk reveal UK government attempts to significantly weaken draft EU climate and energy rules, even as Brexit is underway. “This smells of obstructionism,” Jonathan Gaventa, director of environmental think-tank E3G, told Energydesk. The news comes as the future of the Paris climate agreement hangs in the balance, with the United States refusing to commit to the deal at the G7 meeting. “This leak shows Donald Trump has a mole in the EU, and she is called Theresa May,” Shadow Climate Change Minister Barry Gardiner said. The move also suggests a Conservative government alter European climate and environment rules once they are transposed into British law via the much-touted Great Repeal Bill. Every 1% improvement in energy efficiency means saving the (equivalent of the) annual CO2 emissions of 12 million cars, and averting thousands of premature deaths caused by air pollution, according to data compiled by Friends of the Earth. This article was originally published at Energydesk. A different interpretation is that at least some in Whitehall realize that the EU will be able to force its climate standards (and those on tax havens and …) on the post-Brexit UK as part of the price for market access. It makes a twisted sort of sense to try to water down EU standards pre-emptively. The good news is that UK influence on EU policymaking is now less than Latvia’s. Previous PostCan mini-grids tackle energy poverty in Africa?